Will you join me on this journey by preparing one meatless dish every week? There is a movement called MeatlessMonday.com where you can learn more about the one day a week challenge! This first step will vary depending on whether you purchased mix or ready made polenta. Follow the directions on the mix or cut into slices. Layer on the bottom of the pan. 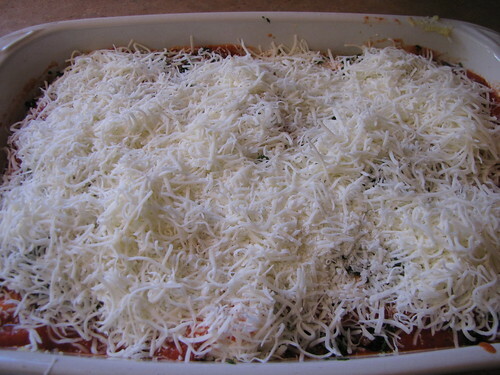 I rubbed a little bit of olive oil on top and sprinkled a bit of freshly grated parmesan cheese on top. Then you will want to add a layer of marinara sauce. Then half of the ricotta cheese. 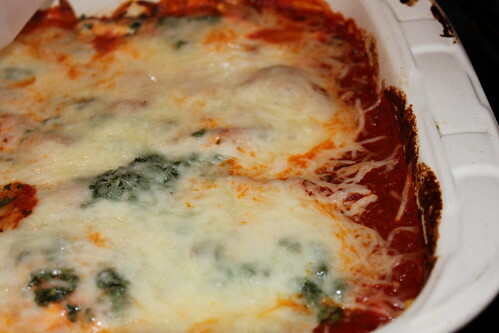 Top with spinach. Repeat layers and then top with cheese. Cook on 375 for 20-30 minutes. I cooked until the sauce was bubbly. It wasn’t popular in our household. 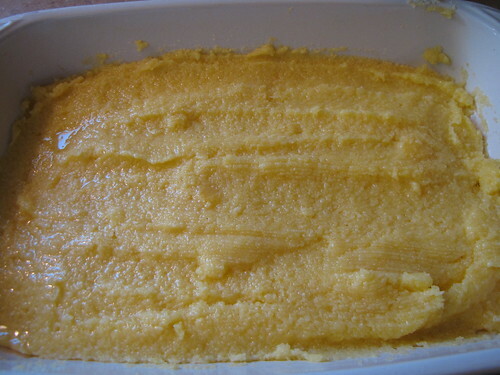 The reason, the texture of the polenta. My daughter thought it was too spongy. Bryan said he could hardly stand to eat that part of it. I didn’t mind the polenta but it was a different texture. They would prefer me to use noodles. However, I think maybe our polenta layer was too thick. So if I was to make it again, I would probably use half the amount of polenta I used in this recipe. 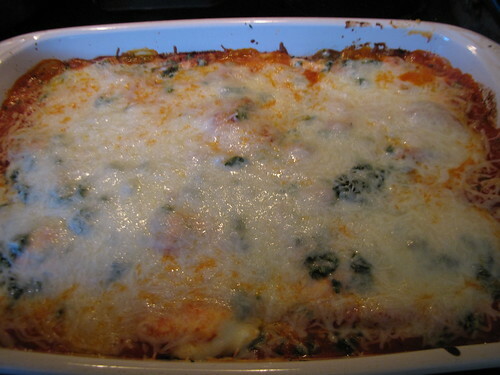 I also based my recipe on this Pesto Spinach Lasagna from Kohler Created. After I started this, I realized I didn’t pick up pesto at the store. I usually forgot at least one key ingredient. The taste may have been different had we had this ingredient. However, I don’t think it would have changed the texture of the polenta. Freeze this meal before cooking or after cooking (reheat) for a easy weeknight dinner. Add sausage to meat this recipe up. 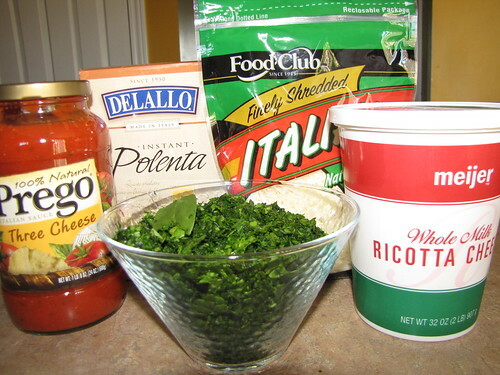 This recipe was inspired by Kohler Created’s Pesto Spinach Polenta. Her pictures are much prettier than mine! 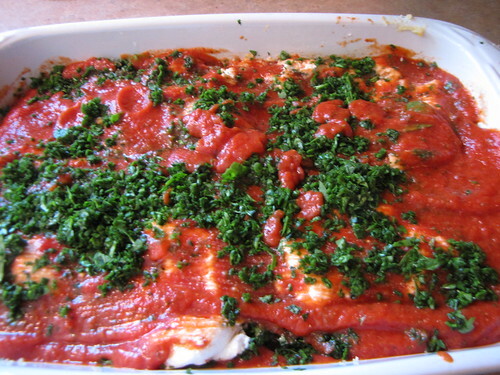 In college, one of our favorite meatless meals was a lasagna. We took two of those giant zucchinis you get out of your garden at the end of summer, sliced them long-wise to be about the size of lasagna noodles, and then layered the “zucchini noodles,” a cheese mixture, and tomato sauce. Yummy and so filling! Okay this looks awesome. however what is Polena? Did you use 8 oz of cheese or 1 cup? That looks like more than 1 cup…but, my eyes have deceived me before! Thanks. The lasagna looks delicious (and I love polenta). This looks delicious. Haven’t had much polenta but I just get sick fo noodles sometimes. Every year I go vegetarian for Lent and you’re exactly right, it’s hard to find great recipes that please the family and don’t hurt the budget. I’ll have to give this one a try! Have you added in green smoothies? We’re enjoying those. Healthy and tasty! So you just add that into any food or you eat it plain? Hey Briana, glad you got a chance to try our recipe. 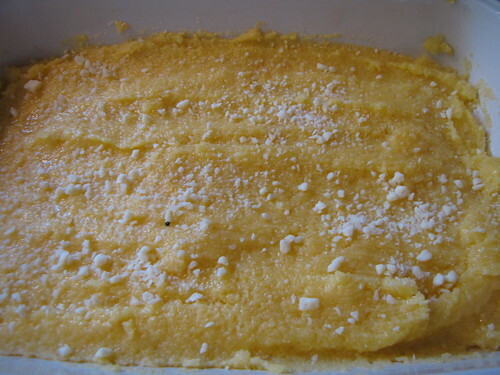 Polenta definitely is an adjustment, and I hear making it from scratch does wonders for reception from others. We’re still adjusting to more meatless meals and not all meals end up a hit. Thanks for checking us out and hope to see you again soon! .-= Jessica´s last blog ..Don’t Fear At-Home Sushi! =-. I love your Meatless Monday recipes. I have been a vegetarian for almost 8 years now and I still struggle to find cheap, easy healthy recipes. Thanks for sharing! I never thought of using polenta as a noodle substitute! I made a veggie lasagna with matzo for the “noodles” yesterday to serve tonight. I really hope it works out. I added chopped mushrooms to the sauce to give a chunkier “meat” texture. We’ll see how the recipe is received! .-= joanna´s last blog ..blue + yellow =-. Matzo? That would be interesting too! I love to try new things….and I love mushrooms! Let me know how it turns out!!! !